Accio knows how to catch your attention – it is amazing combination of clean design, multiple animations and stunning parallax effects. With its great OnePage feature your website would greatly stand out from others. 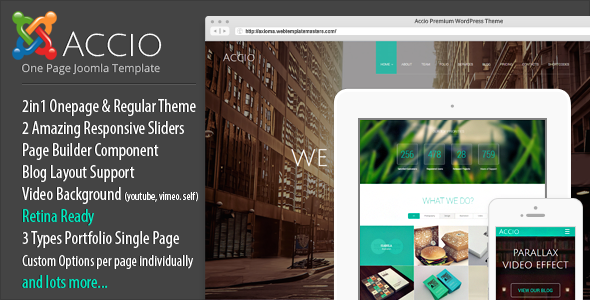 Accio is an ultimate creative portfolio easy to use template with Fully responsive, Mobile Optimized, Retina Ready layout and a Perfectly amazing design with a touch of minimalism at it’s best. Build with Joomla 3.x – We always use newest version of Joomla for build our product you no need worries about up to date version. Build with Page Builder Component – We use ST Page Builder Component with Drag and Drop friendly layout, call any module and every where you want. K2 Component Integrated – K2 was built as a complete replacement of the default article system in Joomla! Its perfect solution for make content layout like Article, Blog … with many options for you. Blog Layout Support – We use K2 Component for make beautiful Blog layout. Bootstrap Framework – Our template build with Bootstrap Framework, very helpful with Responsive layout on any device. HTML5 and CSS3 – Our template build with HTML5 and CSS3, very helpful with Responsive layout on any device. Unlimited Colors – You can choose own color scheme without touching single line of code (or choose one of the 15 predefined styles. Included Quickstart Package – Quickstart package with demo data and standalone version as well. After install this package your site look like on our demo data. Muilti Language Support – You can very easy to add new language to the site by modify language file. Translate Ready – We support Translate ready for English and French but you can easy to add your language on the site. Configuration for Menu – You can configuration Menu on Left or Right. Custom 404 page – You can change the layout base on our 404 style. Item Reviewed: Accio One Page Parallax Responsive Joomla Template 9 out of 10 based on 10 ratings. 9 user reviews.